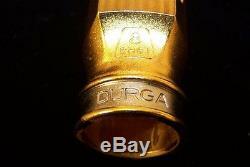 Used item The DURGA is both powerful and fat sounding. It can both scream and play a soft ballad, with a uniquely designed baffle and deeply rounded inner side walls with TW's True Large Chamber, and the Power Ring. The Power Ring is a ring set at the back of the chamber that radically tapers the chamber down, giving the mouthpiece the benefits of our True Large Chamber with the power found in small chamber mouthpieces. It is machined from blocks of solid brass! 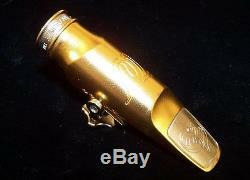 Many alto players who never liked metal mouthpieces before love this mouthpiece. With many patents behind their products, Theo WanneTM mouthpieces are the highest quality and most innovative in the world. The DURGA has a technically advanced design (PATENTED) and manufacturing process (PATENT PENDING). The result is a powerful mouthpiece with a huge core and breath of sound. No longer does the saxophonist need to have a thin sound in order to get huge power and projection. The DURGA is both powerful and fat sounding simultaneously. The Power Ring is a ring set at the back of the chamber that radically tapers the chamber down. This allows the mouthpiece to get all the benefits of the True Large Chamber AND the power inherent in small chamber mouthpieces. The item "Theo Wanne DURGA Alto Saxophone Mouthpiece Size 8" is in sale since Friday, June 30, 2017. 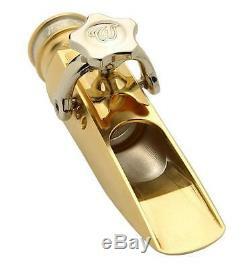 This item is in the category "Musical Instruments & Gear\Wind & Woodwind\Parts & Accessories\Mouthpieces".zipp" and is located in Brandon, Florida. This item can be shipped to United States, Canada, United Kingdom, Denmark, Romania, Slovakia, Bulgaria, Czech republic, Finland, Hungary, Latvia, Lithuania, Malta, Estonia, Australia, Greece, Portugal, Cyprus, Slovenia, Japan, Sweden, South Korea, Indonesia, Taiwan, Thailand, Belgium, France, Hong Kong, Ireland, Netherlands, Poland, Spain, Italy, Germany, Austria, Russian federation, Israel, Mexico, New Zealand, Singapore, Switzerland, Norway, Saudi arabia, Ukraine, United arab emirates, Qatar, Kuwait, Bahrain, Croatia, Malaysia, Chile, Colombia, Costa rica, Panama, Trinidad and tobago, Guatemala, Honduras, Jamaica, Barbados, Bangladesh, Bermuda, Brunei darussalam, Bolivia, Ecuador, Egypt, French guiana, Guernsey, Gibraltar, Guadeloupe, Iceland, Jersey, Jordan, Cambodia, Cayman islands, Liechtenstein, Sri lanka, Luxembourg, Monaco, Macao, Martinique, Maldives, Nicaragua, Oman, Pakistan, Paraguay, Reunion.